Here's a female yellow-headed blackbird. Her coloring is not as bright and solid as the male, but she is just as greedy at the bird feeders. Twenty pounds of bird seed in a week and blackbirds of all sorts ate most of it. I hope they move along soon! We are in the same boat. I've noticed that the starlings are the worst. This is getting expensive. 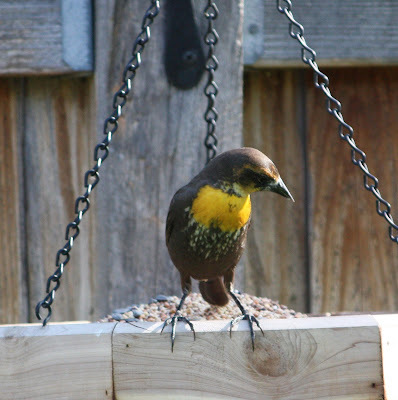 It's amazing how quickly "word-of-beak" spreads regarding the location of bird feeders. My biggest culprits are squirrels.